The collection in this catalog ranges from standard to eclectic. I have also included other gifts suitable for brides and Quinceañeras, including necklaces featuring rosary and saints medals, and wedding rosaries and chaplets. You may also see my Gallery pages for more completed projects. Remember . 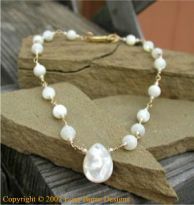 . . many of my bridal designs are conveniently designed to be worn every day, as well as for special occasion! This single decade bridal rosary has many unique features! Every part of it is a piece of art, from the luminescent 8mm mother of pearl beads, to the kissing turtle doves in the center, to the handmade antique white rose glass lampwork bead. See my Gallery pages for more completed projects.